On 21st February 2019, we celebrate the Birth Anniversary of the Mother. 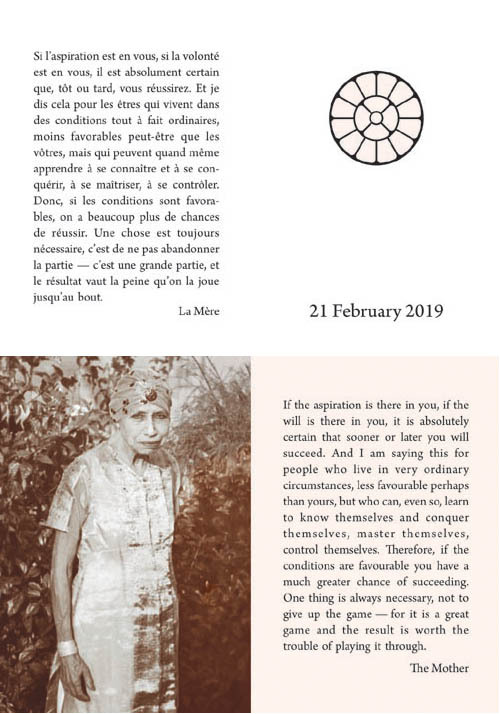 A card with a picture of the Mother and a very beautiful message of the Mother on how with aspiration and will one is bound to succeed in the spiritual quest, was distributed in the Ashram on this occasion. You can download, for the purpose of printing, the foldable original Card here (PDF, 1.94 MB). For viewing, click here.